"Burger Battle Round 3 Results: The Red Rabbit"
Call it a burger from a simpler time. 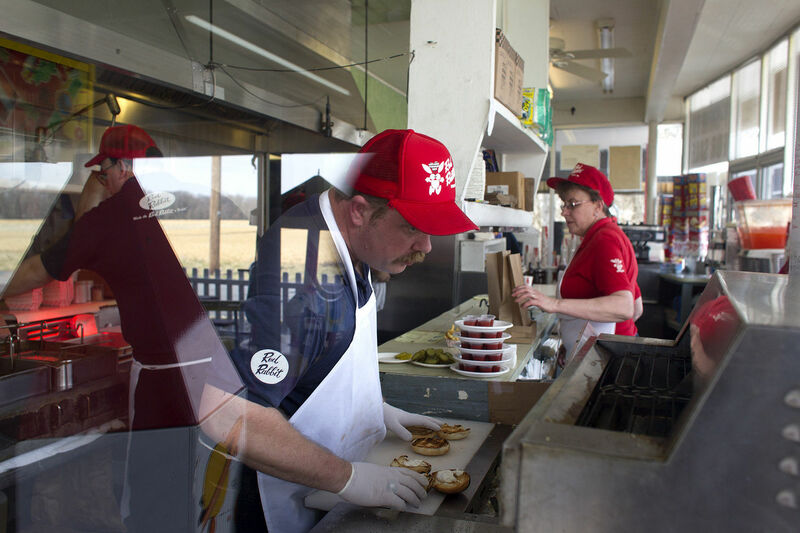 The Red Rabbit’s seed-sprinkled, secret-sauce slathered Bunny Burgers hop to your car window, courtesy of the red-clad waitresses. Metal trays are anchored in place on your car door. 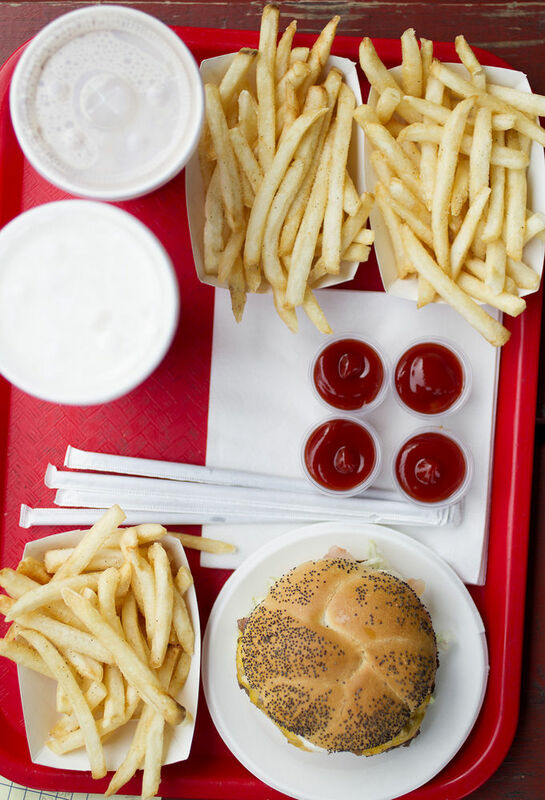 And a nostalgic feast of burgers, shakes and fries unfolds right inside your vehicle. You can practically hear the strains of “Rock Around the Clock” on the AM radio dial. This is drive-in dining like it used to be. Back when chrome-plated cars swam with fins; sweethearts slurped straws planted into the same milkshake; and such road-side joints were the place to see and be seen. 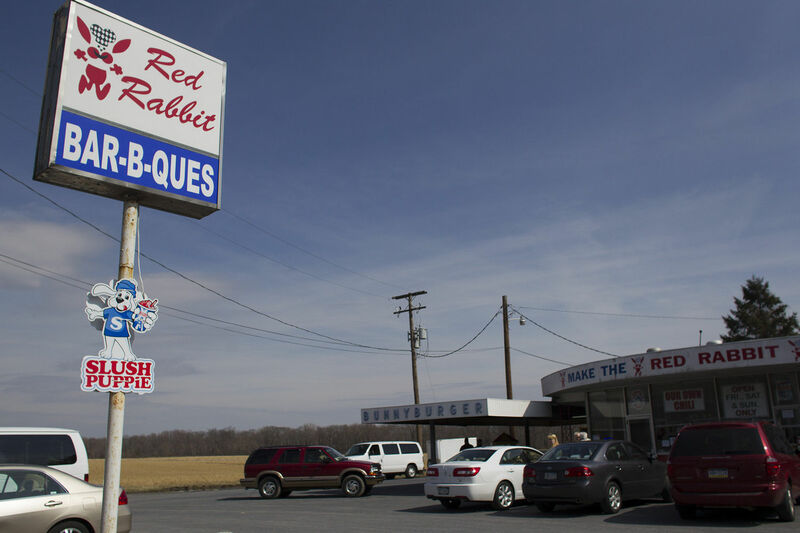 Situated near the crossroads of Routes 322 and 11 & 15 in Reed Twp., the Red Rabbit has been a dining time machine for nearly 50 years, now. Three generations have tended the place, started by current co-owner Cindy Berger’s father. What seems now such a serendipitous location was the site of a defunct restaurant back in 1964. And Cindy Berger recalls her father sitting outside and counting the cars going by before making the deal that would launch the Red Rabbit. Now all that traffic rushing by is the Red Rabbit’s lifeblood, especially in the spring and summer. But also in the fall, when there are Penn State games and half of the northeast seems bound for State College. The football motorcade marches right by Red Rabbit's front door. The Red Rabbit keeps hopping every weekend, Friday through Sunday, except in December and January when the drive-in closes for the season. The Bunny Burger is by far the most popular item on the menu. 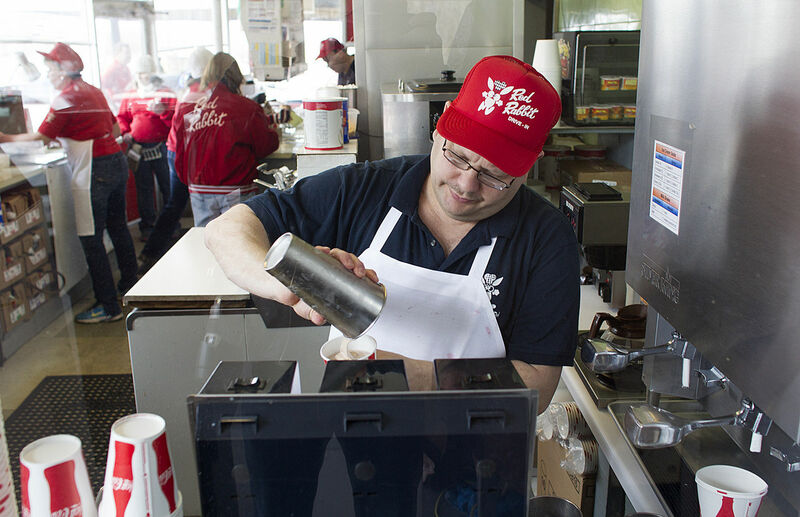 But the fries, sprinkled with “Bunny Dust” and the shakes, made-to-order in either thick or regular, are other fan favorites that keep Red Rabbit regulars coming back. 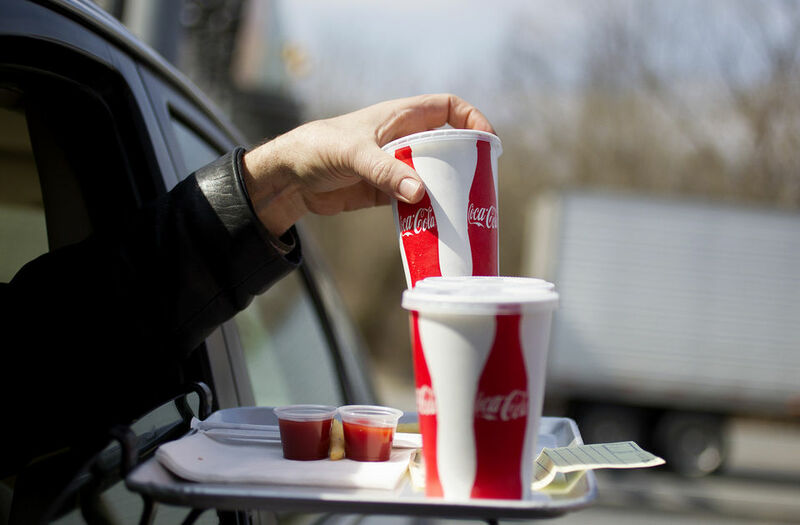 But what really makes this place and its parking lot pile up with cars – even on a chilly mid-March lunch hour – is the rare opportunity to turn back time simply by ordering a sandwich. This is al fresco dining the way it used to be – not on the sidewalk of a fancy city bistro. But in a car or truck, with the radio on, the traffic rushing by, the crickets chirping in the fields beyond, and the night as big as one’s appetite for the way things used to be. First off, the birch beer float? It was my favorite thing at the Red Rabbit. 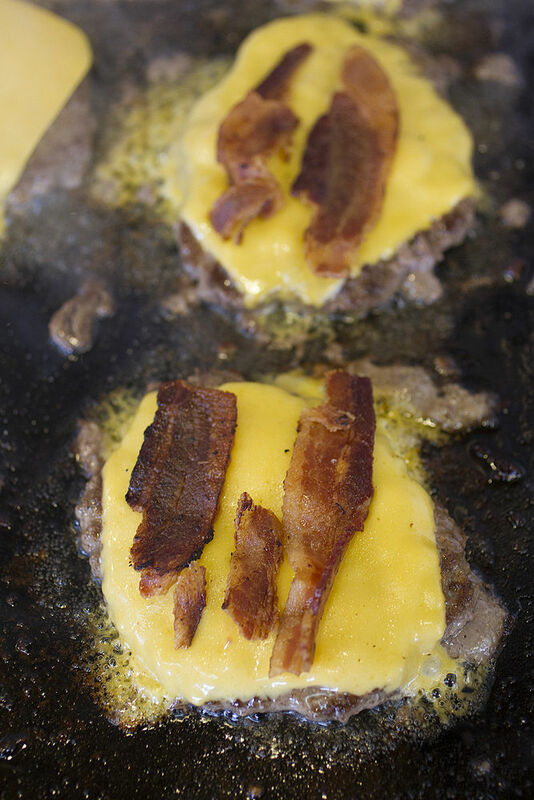 So creamy and delicious, and a great addition to my burger and fry lunch. But, that's not to say the Bunny Burger wasn't exceptional. 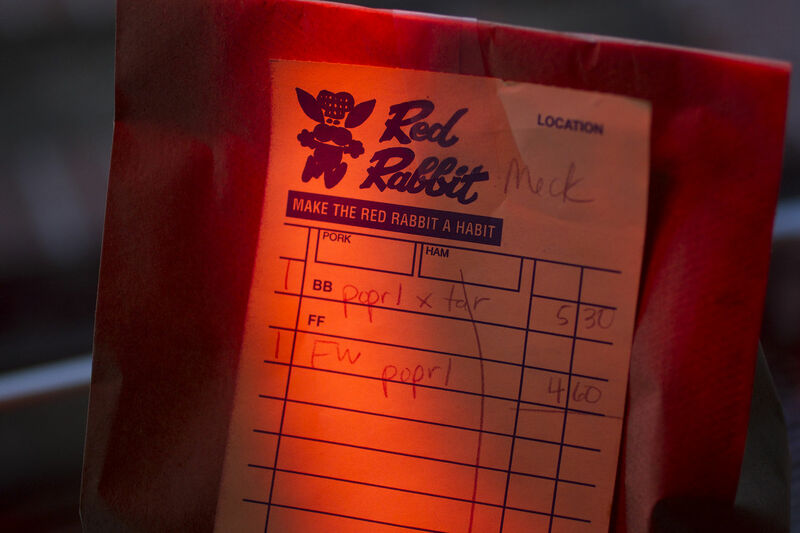 The Red Rabbit uses a frozen patty. They aren't afraid to admit it. But the deal is they know how to dress a burger. 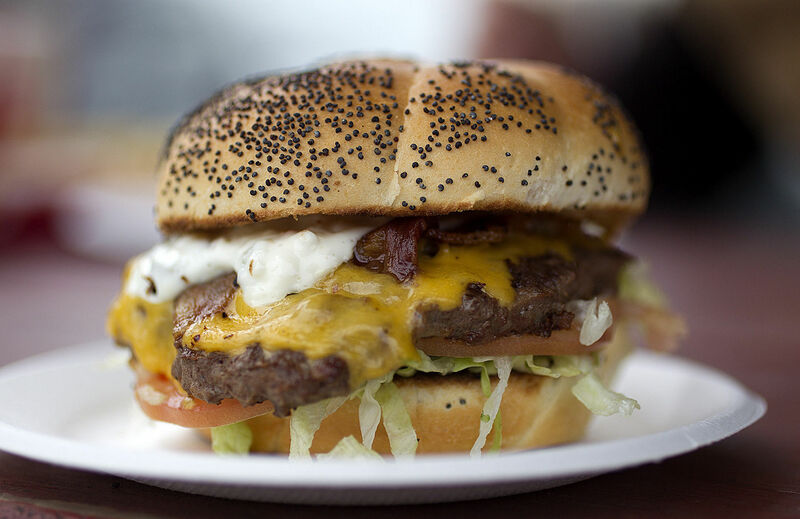 It is the toppings that MAKE this burger, especially the “Bunny Sauce” which is some secret mayonnaise concoction that slightly resembles a tartar sauce. I like the shredded lettuce. It prevents the burger from sliding off the bun. Which by the way, the bun was perfect and held the sandwich together quite nicely. It was sturdy and not too flimsy. A great burger, and worth the trip as much as for the food as for the fun atmosphere. Next time I go back though, it will be on a 75-degree sunny day! Though it was fine and filling, I was not impressed by the Bunny Burger. The lettuce and tomato were adequate, the bun was straight from the plastic bag: nothing to complain about. But also this was not memorable: food that is merely functional at being filling. The burger patty was passable. The meat was thin and leaned on the rest of the burger. What saved the Bunny Burger was the special sauce. It was mayonnaise based but intricate enough to add an immediate flavor to the rest of the burger elevating the entire experience. The fries were fine and when added to an above-average milkshake makes for a fantastic retro experience. Fortunately Red Rabbit has kept up a customer-focused approach familiar to the world of 1964. Even as I was waiting to meet my colleagues in my car a waitress checked in on me. And, that sort of attentive friendliness runs through the staff. I enjoyed the burger but really loved the venue. 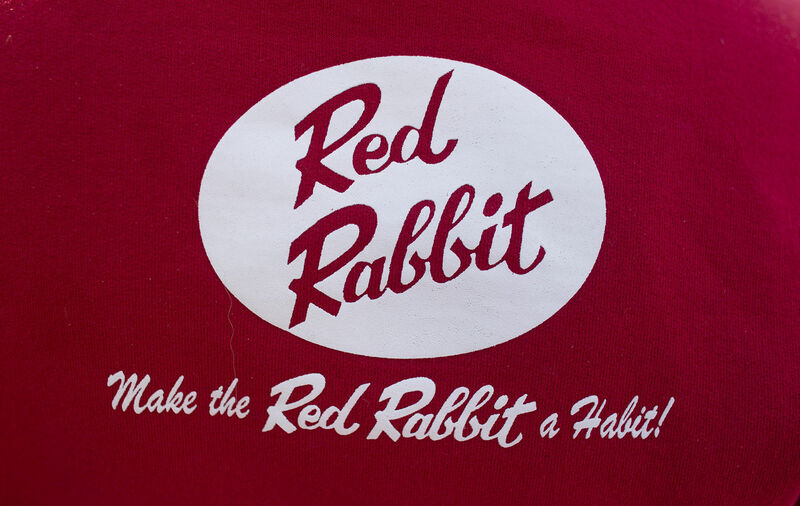 The Red Rabbit Drive In is a product of another era and it stays true to those times. Yes, the pre-made hamburger patty is too-thin. It can’t possibly stand-up to the hand-made, freshly-procured, half-pound burger behemoths that we’ve seen at the first two stops of the Burger Battle. But the Red Rabbit is selling a moment-that-time-forgot experience that will leave your heart full, if not your stomach. What’s memorable about this place are the waitresses smiling outside your car window, no matter the weather. The road-side location, especially on spring and summer evenings. All of it conjures an envious link to another age, not so long ago, when a stop at a drive-in made for a full evening’s entertainment. Simply because it was the perfect place to people-watch, spot cars and relax under the stars. Next Wednesday, the Burger Battle judges blow into Dodge City in Harrisburg for a high-noon hamburger tasting that could shake up the contest. Copyright © 2013 Pennlive.com. All rights reserved. All photos taken during Burger Battle Round 3 at The Red Rabbit in Reed Township. March 15, 2013. Courtesy of Sean Simmers. 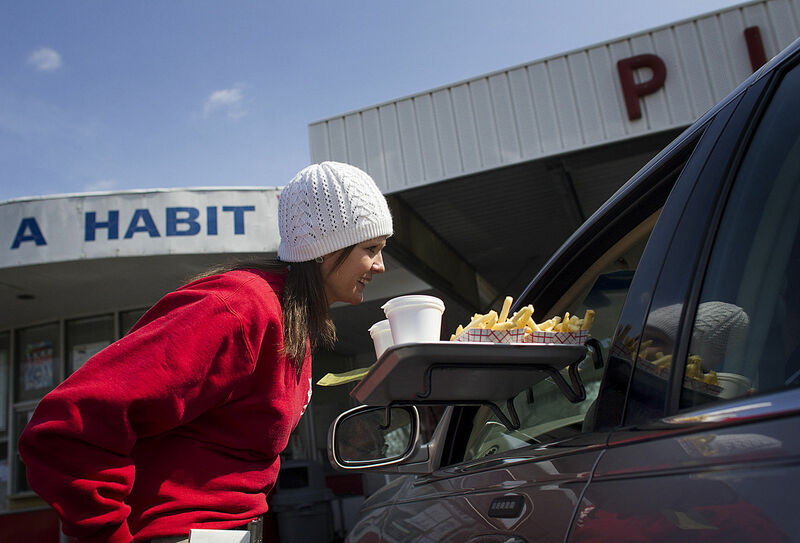 A customer grabs a drink from the tray on the window of their car during Burger Battle round 3 at The Red Rabbit. 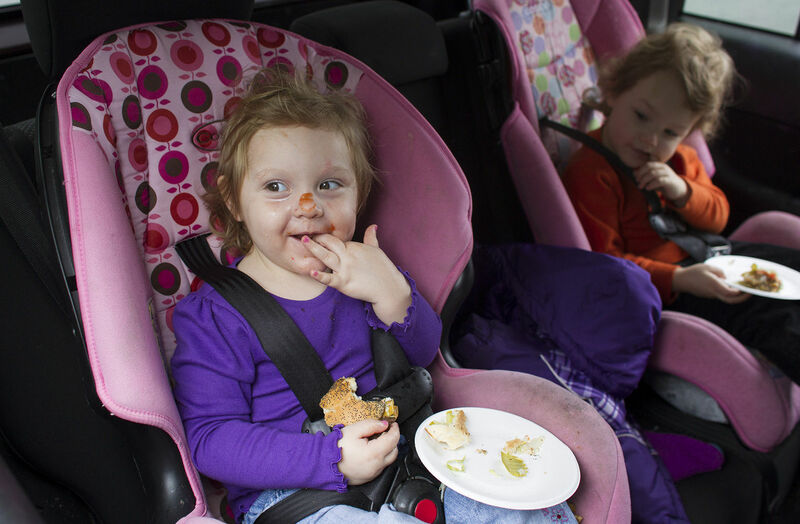 Kaidence Smith enjoys a Bunny Burger in the back of her parents car during Burger Battle round 3 at The Red Rabbit. Burger Battle judges (L to R) Richard Abowitz, Sue Gleiter, Chris Mautner, and John Luciew sample the food during Burger Battle round 3 at The Red Rabbit. 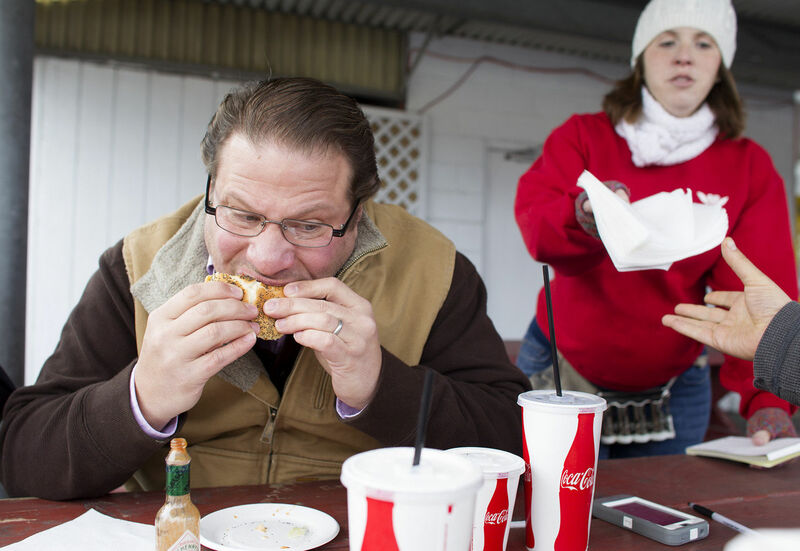 Burger Battle judge, John Luciew samples a Bunny Burger during Burger Battle round 3 at The Red Rabbit. Food ready to be consumed during Burger Battle round 3 at The Red Rabbit. 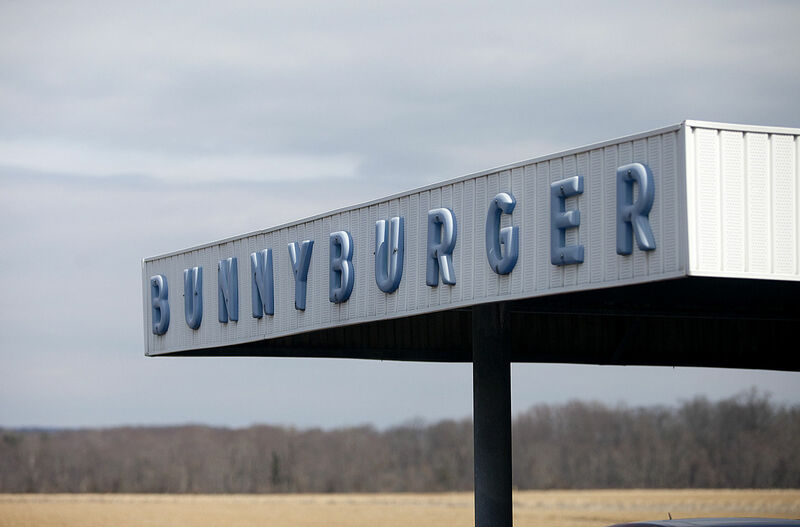 Bunny Burgers from the Red Rabbit Drive-In in Reed Twp. are topped with hickory smoked bacon, melted cheese, lettuce, tomato, pickle and secret sauce on a poppy seed roll. Stephanie Dorman delivers food for Burger Battle round 3 at The Red Rabbit. Ed Rigg prepares milkshakes during Burger Battle round 3 at The Red Rabbit. Tight quarters in the kitchen during Burger Battle round 3 at The Red Rabbit. 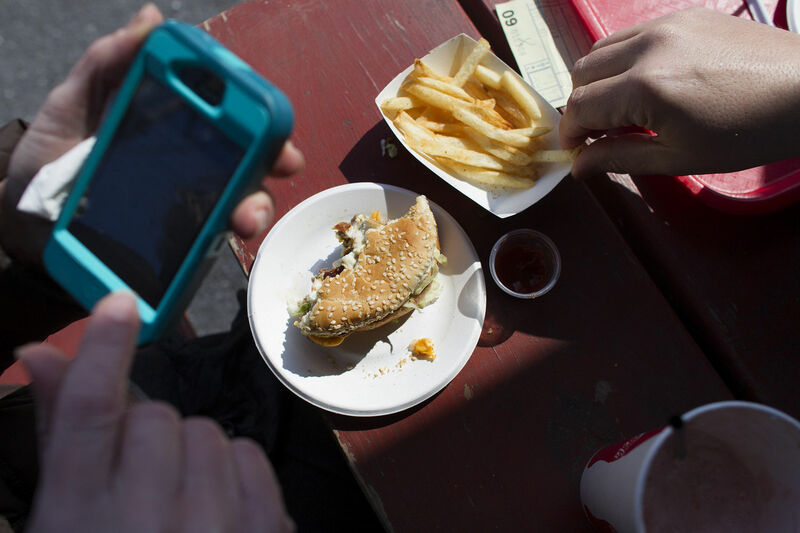 The judges eat and text during Burger Battle round 3 at The Red Rabbit. Linnea Wirth waits on a customer during Burger Battle round 3 at The Red Rabbit. 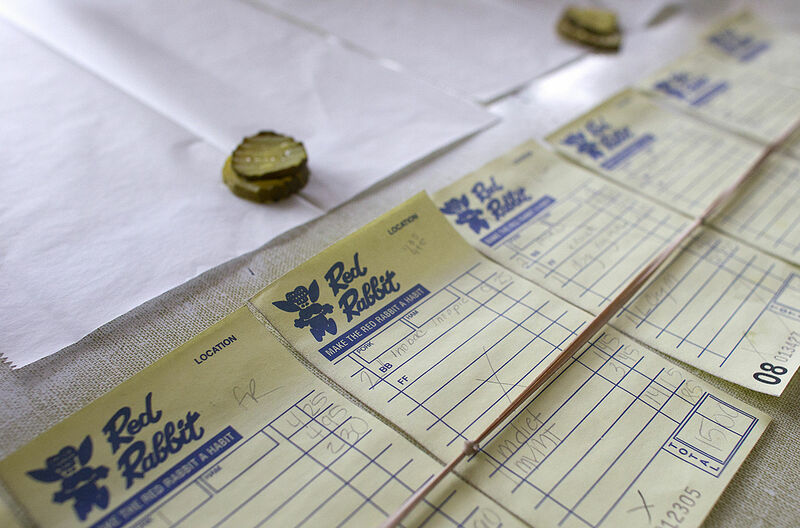 Orders await filling during Burger Battle round 3 at The Red Rabbit. Burger Battle round 3 at The Red Rabbit. 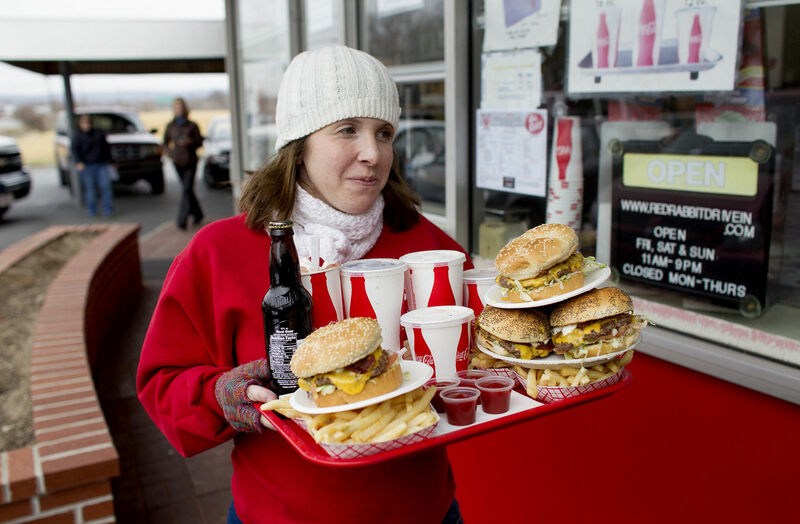 Deb Miller waits on a customer during Burger Battle round 3 at The Red Rabbit. 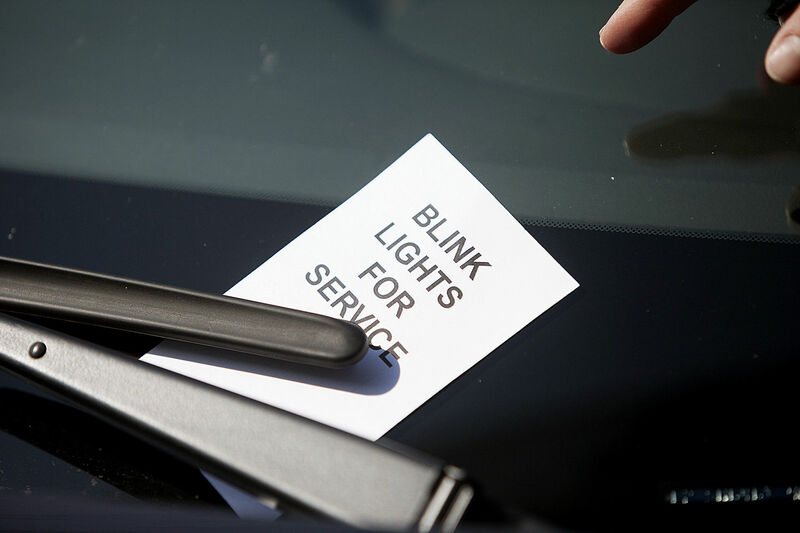 A sign is place under every customers winshield wipers during Burger Battle round 3 at The Red Rabbit. The busy kitchen during Burger Battle round 3 at The Red Rabbit. French Fries are salted during Burger Battle round 3 at The Red Rabbit. 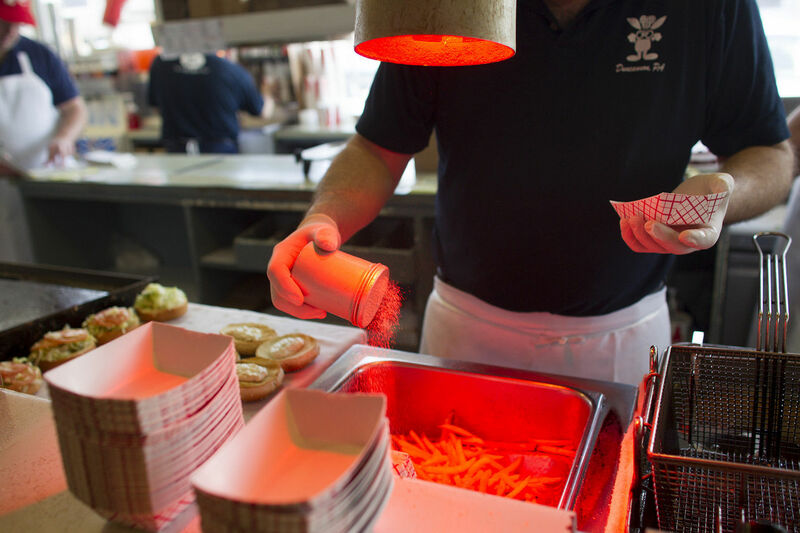 A bag of food stays warm under the hot light during Burger Battle round 3 at The Red Rabbit. Bunny Burgers cook on the grill during Burger Battle round 3 at The Red Rabbit.